This tutorial will show how easy it is to design a nice shimmering Absynth pad without delving too deep into any of the advanced features of this incredibly powerful synth. Perfect for a very wide range of music! It should be expected to hear some pretty fantastic pads being produced with this synth, as it is used by so many like-minded people who create a lot of these types of sounds. And if you are new to using Absynth, then this is a good place to begin to figure out how to make your own complex sounding instruments from scratch. 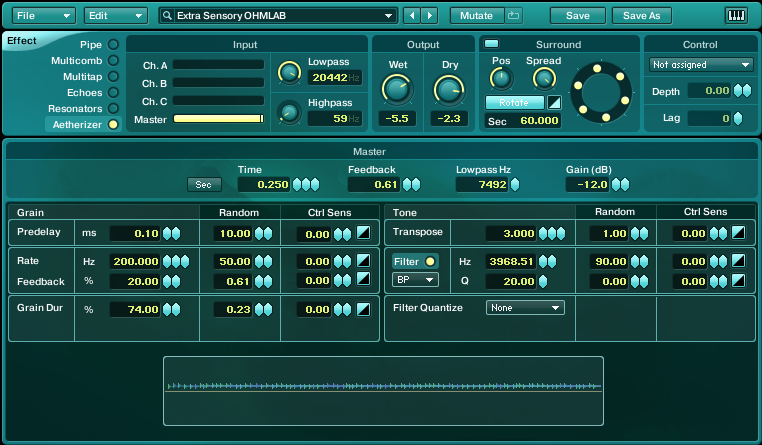 This lesson shares how to use some of the basic features to design a gentle shimmering Absynth pad that can work well with projects ranging from ambient soundscapes to cinematic productions. And it only takes a few minutes to make! 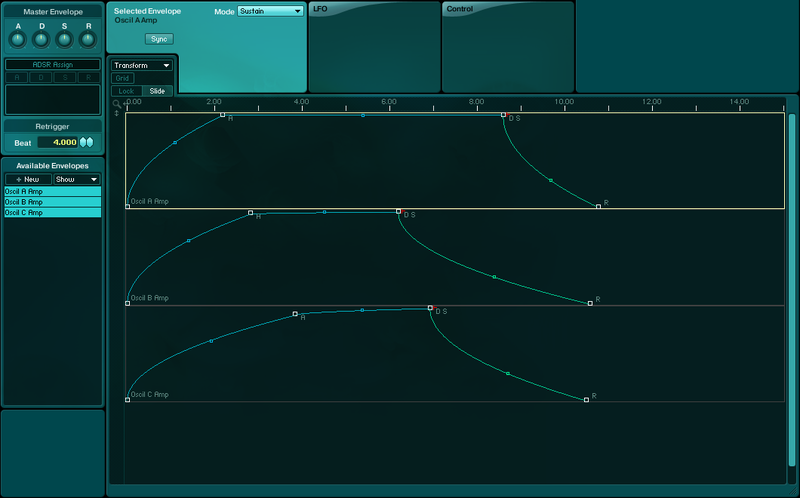 The first step is to select a few waveforms to load into the main oscillator panels. As you can see, I have decided to use the Female Voice waves from the main preset menu. Oscillator module A is loaded with Vox-fem 1, while Vox-fem 2 was loaded into both oscillators B and C. Pay cose attention to the settings on each of the panels shown in the pictures below to help ensure that you can easily replicate the Absynth pad sound being created in this lesson. Now that the base of our sound has been started, it’s time to begin shaping it and modifying it to achieve the desired Absynth pad sound we are after. A Lowpass 4 Pole filter is added to the Oscillator A Module. 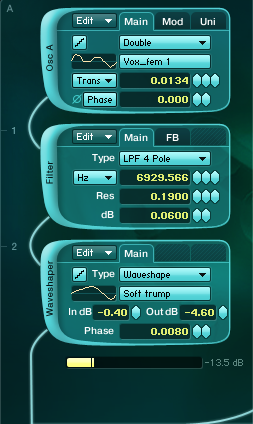 A Waveshaper is also added to this module, running a Soft Trump waveform. A second image below shows the settings made on the FB tab of the lowpass filter unit, as it is using a Hibuzz 1 waveform and is set to run in Waveshape mode. The Oscillator B Module is a bit easier to set up, as it only has a Cloud filter unit added to it. 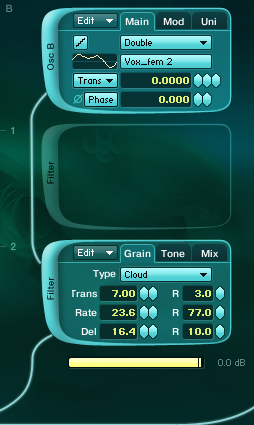 This will be the main sound of this Absynth pad, so the volume of this module is kept at full, while the others have been reduced so they do not overpower the mix. 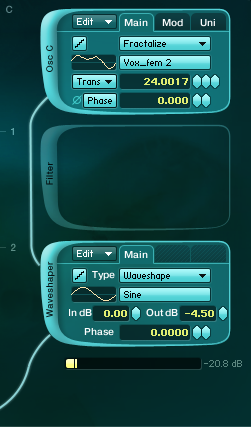 A Waveshaper is added to the Oscillator C Module and is running a standard Sine wave. All of the main oscillator envelopes are set up with similar curves, though there is some variation to keep the delivery and development of this Absynth pad interesting and a little less predictable at first. The main effect in play with this Absynth pad is the Aetherizer, which is shown in the image below. Make sure the settings are matched as close as possible in your synth to help ensure the closest reproduction of the sound, as the smalles of changes can often times have a large impact in the end. Below is a small sample of this Absynth pad in action alongside some drums to give a better idea of how it may be used in a mix. The second half of this recording is a two octave version of the first half, increasing the overall presence, volume and details found in the pad. Please do not forget to shoot us a message before you depart if you happen to have tutorial requests or some feedback for us. Thanks for stopping by!